The central part of the interface consists of the space chart. 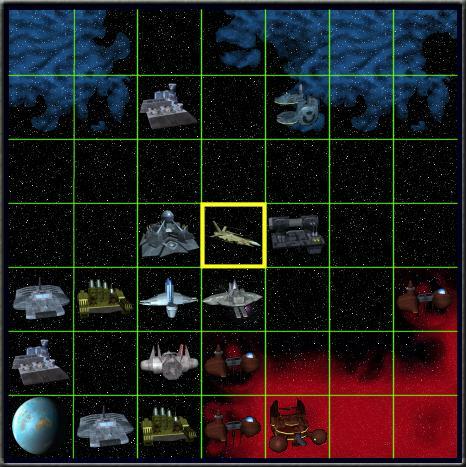 It is divided in 7×7 fields (green lines, not shown ingame), with the current position of the player in the center (yellow box, not shown ingame). With a Premium Account you are able to expand the space chart to 9×9 fields [MECH:Account Settings]. Ship movement is possible by left-clicking on the desired destination field. If you fly onto an object such as a building or a planet, not your ship but that object will be visible on the space chart - you will hide behind the object. Energy fields (the completely blue ones) are impassable. Shows the current amount of fuel in the engine. An Auto Refueler automatically fills up the engine with fuel when you run out as long as you have some in your cargo hold. The basic engine has a maximum capacity of two tons of fuel. Stronger engines can contain more fuel but also use more fuel per move. Number of Action Points (for short: APs). Every 6 minutes you receive 24 APs. Every action you make costs Action Points (moving, fighting, etc. but not using the interface menus). The maximum is 5000. At 0 or less you are unable to do anything. Shows the AP Cost for leaving the current field (both diagonally and horizontally/vertically). Stronger engines decrease this number. Starting values: Normal Space 10, Nebulas 15, Energy 19, Asteroid Fields 24, Exotic Matter 35. The most important number for many players. Wealth is almost equal to power. Your ship will move diagonally until it has reached the destination's altitude, then horizontally or vertically. Note that due to this system, the chosen path may not always be the shortest one, concerning movement cost. Also, opponents will not be evaded automatically. To fly your ship along a desired path, move field by field. If the game's navigation system does not find a possible route to the destination, an error message will appear: Auto-Pilot failure, please assist! Diagonal movement costs as many APs as horizontal or vertical movement - the "chessboard distance" is used.